After canning John Thompson III, Georgetown has found its replacement. According to ESPN 980, the Hoyas have decided to hire Charlotte Hornets assistant and former Georgetown and Knicks legend Patrick Ewing as their new head coach. Ewing has worked as an NBA assistant coach for the past 15 years, though he’s been trying to step out as a head coach for several years now. Following stops in Houston and Orlando—he worked with Dwight Howard when Howard was one of the league’s most productive big men—his most recent stint was in Charlotte, where he spent the past five seasons as a part of Steve Clifford’s staff. Ewing has reportedly interviewed for several NBA gigs the past couple years, looking to make the jump from assistant to head coach in the pros; as he was never extended an offer to coach his own professional team, he remained on Clifford’s staff before the Georgetown opportunity appeared. According to Jeff Goodman, before settling on Ewing, the Hoya athletic department unsuccessfully attempted to lure several big-name coaches—Notre Dame’s Mike Brey, Harvard’s Tommy Amaker, and Xavier’s Chris Mack, per an industry source—to fill the position after employing the services of search firm Korn Ferry. The move to bring in Ewing keeps the Georgetown men’s basketball program in the Big John family (the elder Thompson coached Ewing in the 1980s), which it seems is becoming an unwritten requirement for the job. Ewing has long credited Thompson as being instrumental to his on-court success. 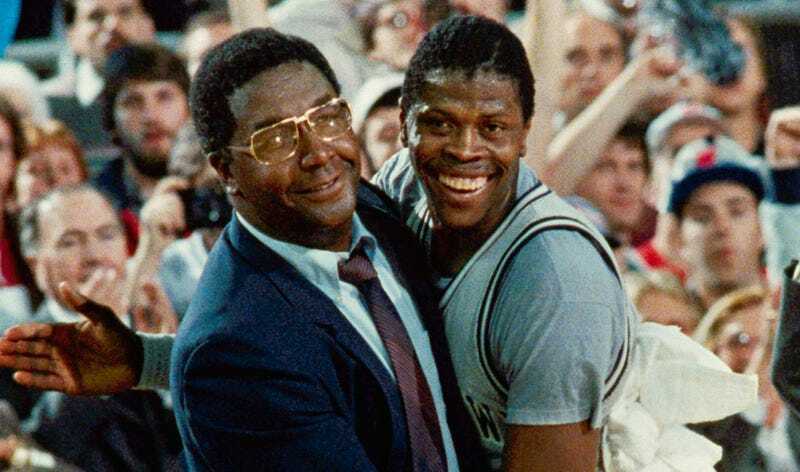 As the team’s center, Ewing and the Hoyas went to three Final Fours and won the 1984 title. Ewing and Thompson have publicly kept their bond strong since Ewing moved on to pro ball. Ewing’s son, Patrick Ewing, Jr., attended Georgetown and played basketball for two years under Thompson III after transferring from Indiana. In 2014, the elder Ewing and his agent David Falk (also Thompson’s long-time agent) donated $3.3 million to Georgetown for a new athletics center. For now, though, Georgetown will be praised for finally giving Ewing an opportunity to run his own team, and Ewing, being the massively popular personality fans love to recall dunking in the Garden and over Phi Slamma Jamma, will be celebrated. Come next season, when the focus has shifted to the fact that this still-celebrated program has failed to draw interest from any of its local talent and missed three of the past four NCAA tournaments, we’ll see how the legacy choice works out.